One of the very best plug-ins just got that little bit better. Buy it, install it, and then wonder how you ever got by without it. Stunning sound. Good value. FAT mode rocks. New preset-saving mode. Improved sensitivity. Auto-release mode is useful. The new preset-saving feature should see the net filling up with VW2 patches. The interface is very familiar - why mess with a winning formula? The VintageWarmer concept is based around a single- or multiband limiter/compressor with analogue modelling saturation controls. In layman´s terms, this makes audio sound deliciously phat, rich and analogue, whether you apply it to individual tracks, groups or even your complete mix. The question, then, is, how have PSP gone about improving on an already near-flawless plug-in? Well, the basic design of VW2 is almost identical to that of version 1.65. The main differences are a few extra controls - an auto-release section, a Brick Wall limiting button and a switch to engage the FAT function. Engaging Brick Wall does what you´d expect, ensuring that no signal level above 0dB slips through. This is ideal for mastering purposes and also enables you to push the saturation levels even further than before. The Auto and Long buttons are self-explanatory, tailoring the release time to the incoming audio signal. FAT is one of those terms that has you wondering: which came first, the chicken or the acronym? Frequency Authentication Technique is what PSP have named their double-sampling processing system (already available in Neon and MasterComp), and its presence means that there are fewer aliasing artifacts, particularly when you drive things hard. Ultimately, this technology makes the signal sound more, er, fat. If this doesn´t really clarify things, permit us to assure you that with FAT engaged, the signal becomes silky smooth. So smooth, in fact, that you can forgive the fact that it needs more than double the CPU power to run. Other than those extra controls, little has changed on the front of the GUI, and flipping round to the back reveals even less that´s new. In fact, the only real differences on the back panel are a doubling of the saturation values (from +6dB to +12dB) and a quadrupling of the release adjustment resolution for much greater control sensitivity. So there you have it. How do you improve a near-perfect plug-in? PSP have got the answer: you make it more sensitive, implement the latest coding techniques, add a couple of new features and ensure that it still sounds rocking. Mission accomplished, we´d say. 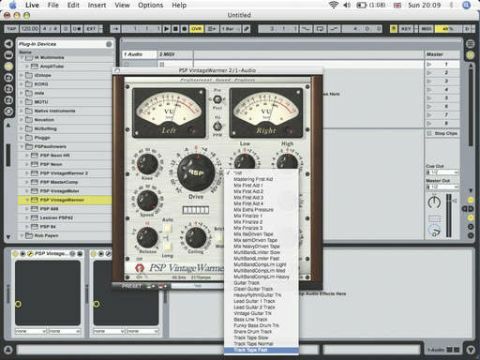 One of the most essential plug-ins of all time just became even more indispensable.